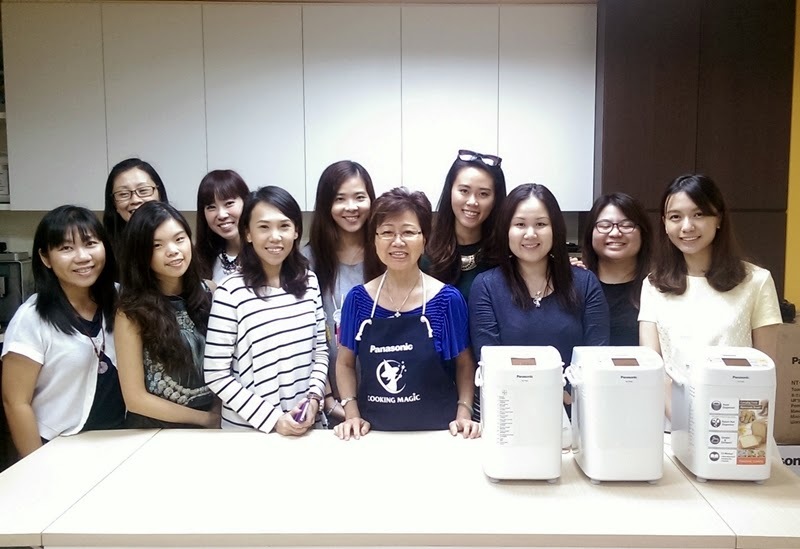 I am invited to attend the Panasonic Automatic Bread Maker SD-P104 Cooking Demo conducted by Ms Theresa. I got to say that I am convinced by how wonderful this machine can create. I got to say this is better than outside selling. It tastes so light, non-oily and non-heavy. 1. Place above ingredients (except mixed nut and yeast) in the bread pan. 2. Place yeast into the yeast dispenser and nuts into the nut dispenser. 3. Select Menu no.2 for “Rapid “ mode, and select “Raisin” mode, next press start. 4. Once ready, remove bread from pan, leave to cool before cutting. So soft, light, yummy, hot and nice fragrance. 1. Place all the ingredients into the bread pan except yeast in the yeast dispenser. 2. Select menu 10 and press start. Display shows 45 minutes. 3. Once ready, remove dough from the bread pan and knead it on a lightly floured surface until elastic and springs back when touched. 4. Divide dough into 2 portions, shape dough into a flat circle and place it onto baking paper. 5. Press the cherry tomatoes, black olives and mozzarella cheese into the dough. 6. Leave dough to rise at 40C for about 50 minutes or till it doubles in size. 7. Brush the surface with olive oil, sprinkle with black pepper, rosemary and paprika. 8. Bake in a preheated oven at 210C for about 16 minutes. Note: Dough best prepared in Panasonic bread maker SD-P104. Best baked in Panasonic microwave oven NN-DF383 / NN-DS592. 1. Add all the ingredients into the bread pan except yeast into the yeast dispenser. 2. Select bread dough no.9, next press start. 3. Press “Stop” when you hear the beep sound. Take out dough. 4. Use spatula to divide the dough into 12 even pieces, shape them into balls, cover with towel, rest for about 15 mins. 5. Shape them into desired shape. 6. Roll out dough and wrap over hot dog. 8. 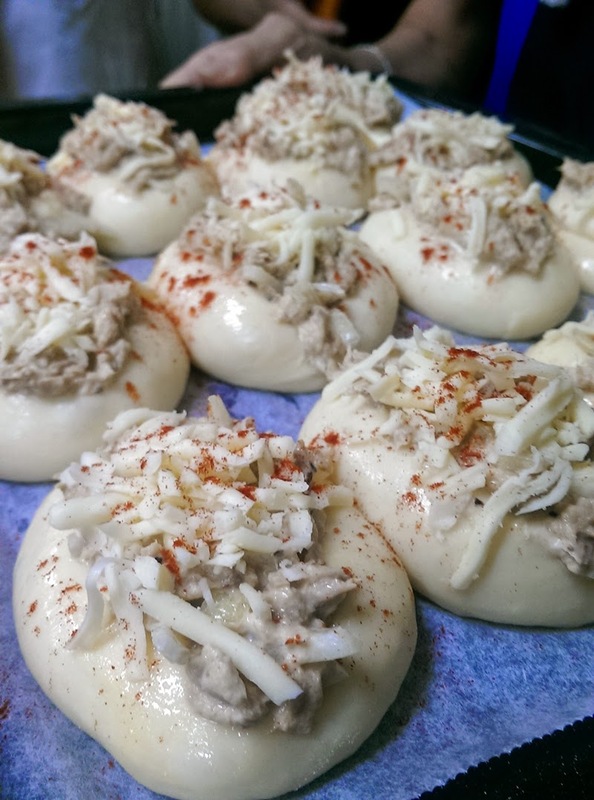 Egg wash bun, pipe mayonnaise, tomato ketchup and sprinkle cheese on top and bake in a preheated oven at 200C for about 14-15 mins. Note: Dough best prepared in Panasonic bread maker SD-P104. Best baked in Panasonic microwave oven NN-DF383B. I simply love this. It is so soft! I would say this Bread Maker is light and compact because the dimension is approx. 24.1(W) x 30.4 (D) x 32.2(H)cm and weight is 6.1kg. You may carry it anywhere (or to your friend's/ family's house) if you require. The Panasonic SD-P104 Bread Maker cost $329, from major electrical stores. I decided to get myself one soon! I am a bread lover, therefore I am unable to resist this fast, easy, convenient, non-messy, natural, fresh way of HOME-MADE Bread Maker!! You do not have to be a professional baker to bake yummy, soft bread/dough! Hopefully I can try out more new recipe!! Share with me if you have any nice or new or even unique recipes. 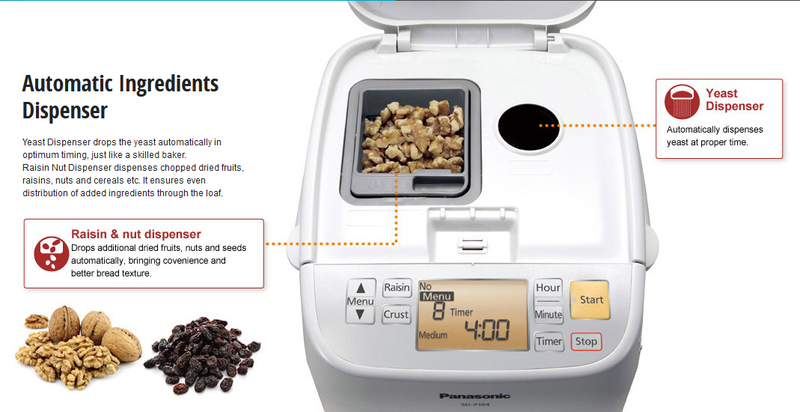 Stay tune for my bakes using the Panasonic SD-P104 Automatic bread maker. Thank you so much Panasonic and OMY.sg for this nice sharing session.